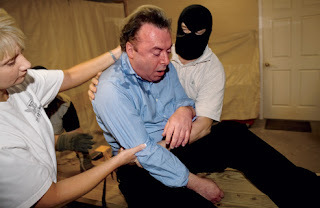 Christopher Hitchens has changed his tune on whether or not waterboarding is torture – after trying it out for himself. As if detecting my misery and shame, one of my interrogators comfortingly said, â€œAny time is a long time when youâ€™re breathing water.â€ I could have hugged him for saying so, and just then I was hit with a ghastly sense of the sadomasochistic dimension that underlies the relationship between the torturer and the tortured. I apply the Abraham Lincoln test for moral casuistry: â€œIf slavery is not wrong, nothing is wrong.â€ Well, then, if waterboarding does not constitute torture, then there is no such thing as torture. Pick up the August issue of Vanity Fair, read the article and you can even watch the video. Didn’t last two bloody drops!